Salvinia minima is a floating aquatic fern that invades a variety of aquatic habitats with salinity levels as high as 4-7ppt. Salvinia minima experiences exponential growth that allows it to completely cover waterways impeding traffic, blocking sunlight, decreasing oxygen levels and degrading habitat for native species of wildlife. Salvinia minima is a free floating, rootless aquatic fern 1 to 4cm long. It has horizontal branching rhizomes that float just below the water surface and produce, at each node, two floating leaves (fronds), and a third, submersed leaf that is dissected into filaments. The leaves are distributed in whorls of 3. Floating leaves are orbicular to oval in shape, with heart shaped bases and rounded to notched tips. Leaf lengths range from 0.4 to 2.0cm. Smaller, orbicular leaves lie flat on the water surface while larger leaves become elongated and fold upright on the midrib. Shade grown leaves remain broadly orbicular, and emerald green. Leaves grown in full sun become larger and elongated and often change from emerald green to rusty brown with maturity and senescence. The upper surfaces of floating leaves are uniformly covered with rows of white, bristly hairs. The stalks of each hair divide into four thin branches that are spreading and free at the tips. The branching hairs create a water repellent shield. Long chestnut coloured hair coats the underside of floating leaves, the submersed filaments, buds and the rhizome (Aquatic Plant Information System, 2002; Jacono, 2003). The continuous branching and fragmentation of rhizomes turns out large volumes of vegetative daughter plants throughout the growing season. Lateral buds deeply imbedded in the rhizome, may lie dormant during periods of reduced moisture and cold temperature. Small rhizome fragments, commonly sheltered in associating vegetation, provide material for reintroduction on the return of favourable growing conditions (Jacono, 2003). Salvinia minima grow in still waters of ponds, small lakes, canals, and slow streams. It can also be found in shallow backwaters of bayous, oxbows, ditches, cypress swamps and marshes inhabiting water bodies with salinity levels as high as 4-7ppt. S. minima is commonly cultivated in aquaria and decorative pools (Aquatic Plant Information System, 2002; and Jacono, 2003). 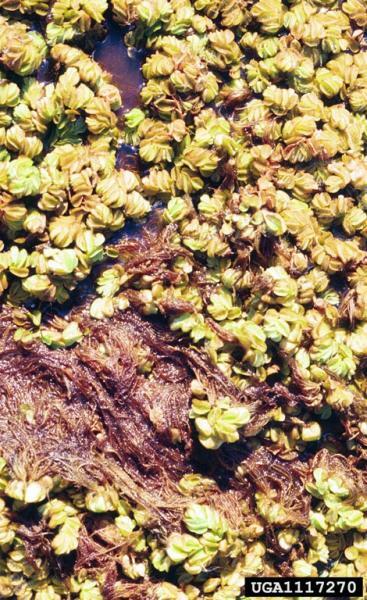 Salvinia minima reproduce by vegetative fragments (Aquatic Plant Information System, 2002). S. minima is believed to be a sterile species. It is not known to produce fertile spores and is postulated to be of hybrid origin. Regardless, sporocarps are common among the submersed leaves of large plants. 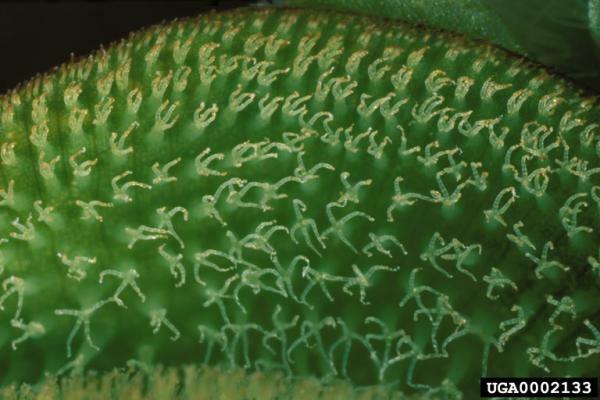 Sporocarps are sacs, which enclose smaller sacs (sporangia) that are formed to hold microscopic spores. Shaped like small lemons (~1mm wide) sporocarps are attached in spirals along the main axis of the submersed filaments (Jacono, 2003). S. minima is still widely available in the water garden trade, either as a sale item or a contaminant (Jacono, 2003).Most likely the discharge of spore contaminated ship ballast from international ship traffic in the St. Johns River at Jacksonville was responsible for introducing Salvinia minima into Florida (Schmitz et al. 1988). 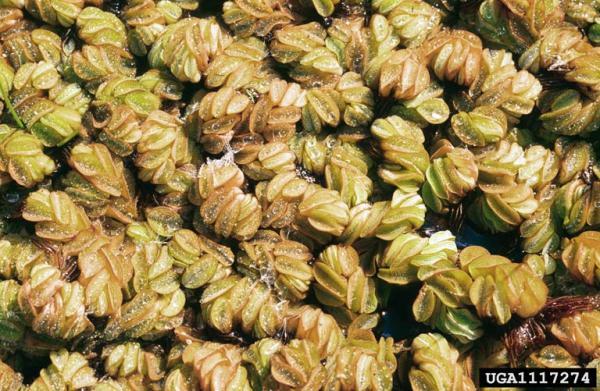 Recommended citation: Global Invasive Species Database (2019) Species profile: Salvinia minima. Downloaded from http://www.iucngisd.org/gisd/species.php?sc=570 on 22-04-2019. 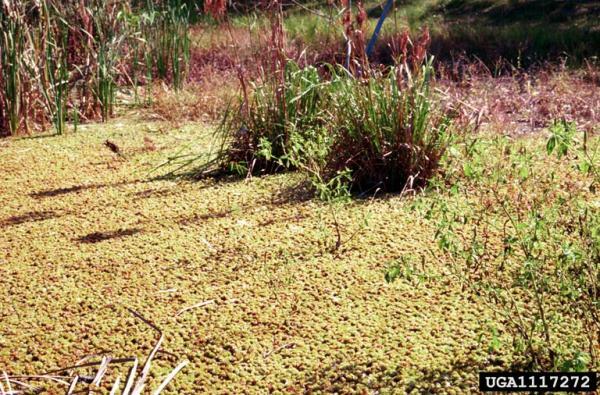 Salvinia minima produces excessive surface growth, which can impede waterways and restrict boating. During earlier stages of colonization S. minima demonstrates exponential growth rates. It has been recorded blanketing waterways 19.3km long and 110m wide and mats have been measured as thick as 20 - 25cm. Dense infestations block out sunlight and decreases oxygen concentration to the detriment of fish and other aquatic species. When plant masses die, decomposition lowers dissolved oxygen still further. S. Minima can also outgrow and replace native plants that provide food and habitat for native animals and waterfowl. S. Minima can clog irrigation systems, negatively impact fisheries, interfere with power production, and clog water intakes (Aquatic Plant Information System, 2002; Jacono, 2003; Madeira et al. 2003; and McKinney and Durocher, Undated). Mechanical: S. minima is vulnerable to conditions of salinity. In central North America along coastal sites, S. minima is found only during wintertime, when freshwater outflow is high and salinity measurements decline to 4 - 7 ppt. S. minima is regularly controlled by opening gates to allow saline water from the Gulf of Mexico into the bayous (Jacono, 2003). If the water level can be dropped several feet, research has shown that this has a proven effect at salvinia control. However, in order to be effective, water levels must remain low long enough to allow for the desiccation or freezing of stranded plants (McKinney and Durocher, Undated). Booms and other barriers may be useful in confining infestations or restricting entry into sensitive areas. However, in areas with significant current or wind action their utility is limited without frequent clearing and maintenance since plants will accumulate against barriers until pressure forces them over or under the barrier (McKinney and Durocher, Undated). Chemical: The following herbicides have been reported giving successful control of S. minima with multiple treatments: Diquat, Fluridone, and Glyphosate. Unfortunatly, due to the extremely large number of individual plants that can be present, applying herbicide to each plant is difficult. The dense pubescence on the leaf surfaces can negatively impact the effectiveness of certain types of herbicide applications. These thick hairs can impede herbicide penetration when using any type of foliar spray application. (McKinney and Durocher, Undated). Biological: Cyrtobagous salviniae is an accidentally introduced species found primarily in Florida. Scientists have hypothesized that the presence of the C. salviniae in Florida may account for the less aggressive growth of S. minima in this area, when compared to troublesome growth that occurs in Texas and Louisiana where the weevil is not found (Center et al. 2001). Informations on Salvinia minima has been recorded for the following locations. Click on the name for additional informations. Center, T.D., Davern, T.R., and Jacono, C.C. 2001. The adventive status of Salvinia minima and S. molesta in the Southern United States and the related distribution of the weevil Cyrtobagous salviniae. Castanea 66 (3): 214-226. Jacono, C.C. 2003. 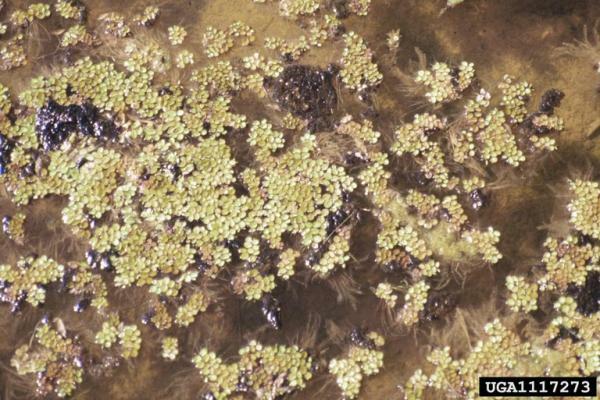 Salvinia: Salvinia minima - Common Salvinia Nonindigenous Aquatic Ferns in the United States (Salvinia molesta - Salvinia minima ) and their Biological Control, Cyrtobagous salviniae, the Salvinia Weevil - USGS. McKinney, L. D., and P. P. Durocher. Undated. Aquatic Vegetation Management In Texas: A Guidance Document. Texas Parks & Wildlife Department INLAND FISHERIES. Aquatic Plant Information System. 2002. Salvinia minima Baker (Water Spangles). Caudales, R., E. F. Hernandez, A. S. Perez, and H. A. Liogier. 2000. Aquatic and Wetland Plants of Puerto Rico. I. Pteridophyta. Anales Jardin Botanico De Madrid 57(2). Flora of North America. Unadted. Salvinia minima Baker. Leon, B., and K. R. Young. 1996. Aquatic plants of Peru: diversity, distribution and conservation. Biodiversity and Conservation 5, 1169-1190. Madeira, P.T., Jacono, C.C., Tipping, P.W., Van, T.K., Center, T.D. 2003. A Genetic Survey of Salvinia Minima in the Southern United States. Aquatic Botany 76:127-139. Maki, K., and S. Galatowitsch. 2004. Movement of invasive aquatic plants into Minnesota (USA) through horticultural trade. Biological Conservation 118 (2004) 389-396. Schmitz, D. C., B. V. Nelson, L. E. Nall, and J. D. Schardt. 1988. Exotic Aquatic Plants in Florida: A Historical Perspective and Review of the Present Aquatic Plant Regulation Program . Proceedings of the Symposium on Exotic Pest Plants, November 2-4, 1988, University of Miami, Miami, Florida Technical Report NPS/NREVER/NRTR -91/06 p 303-326. USDA-GRIN (Germplasm Resources Information Network). 2006. Salvinia minima. National Genetic Resources Program [Online Database] National Germplasm Resources Laboratory, Beltsville, Maryland.